Supposedly named after the greek nymph Minthe, this Pure Leaf Tea with Peppermint infusion is carefully dried to lock in the essential oils. The clear and strong menthol note adds a nice freshness to its unique taste. • Brewing Instructions/1 Tea Bag: 100˚ Celcius 4 mins. • Guarantee an exceptional tea experience that your guests will remember. 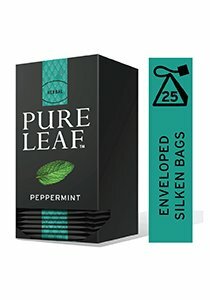 • Pure Leaf premium Peppermint in 20 enveloped silken pyramid teabags. • Uplifting fresh menthol aroma, lingering cooling sensation and minty flavor. • Ensure your perfect serve with Pure Leaf teaware for hotels, restaurants, and cafes. • Pure Leaf long leaves from the finest tea estates in the world, are simply picked, rolled and dried using artisan methods to craft exceptional flavours. • Sustainably sourced from Rainforest Alliance Certified farms. Ambient (Store in a cool and dry place away from direct sunlight and moisture) - 25°C. Store in cool and dry place away from strong odours.